Who Will Be Covered by National Health Insurance? 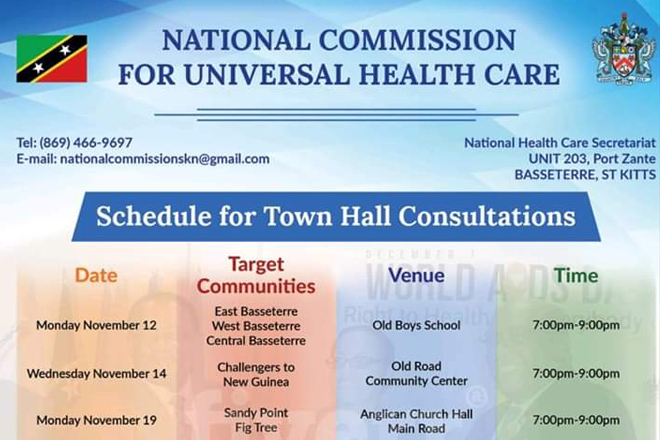 Chairperson of the National Health Insurance Commission, Azilla Clarke says a major concern of many persons attending the public consultations that have been held recently is the question of “ who will be covered”. In an interview with ZIZ News, Miss Clarke said National Health Insurance coverage will be based on principles similar to that of Social Security. She said while all sick persons will be covered, it is expected that services will be available to assist persons in making decisions that are better for their health. Ms. Clarke said the “ wrap around service” is important as persons will depend greatly on it to to make better decisions in regards to their health. The next public consultation takes place on Wednesday at the St. Pauls Primary School. Ms. Clarke also noted that in efforts to effectively gather the information needed to formulate the policy for universal health care for the federation, the National Health Insurance Commission has been using a number of strategies to get information out. These include Facebook, radio programmes, sending the green paper to specific stakeholders and holding strategic meetings with cross sections of those stakeholders.